Can I Teach You Organic Chemistry, Biochemistry and Nutrition in a Few Blogposts? The themes in my blog are the scientific issues in nutrition, how to interpret data in the literature and my take on policy issues like taxing fat and taxing sugar. The most important thing, though, is the basic science because you really can’t understand nutrition without biochemistry and you really can’t do biochemistry without organic chemistry. Organic chemistry refers to the chemistry of carbon compounds. The term once referred to the chemistry of living organisms but now would includes polyethylene as much as fructose and, in the extreme case, the plastic bottles made from corn. I am going to try to present the science and I will start from scratch and make it very elementary. My experience is that chemists don’t mind very elementary — at professional seminars, it is the Nobel prize winner who asks the really simple question (because he doesn’t care what you think of him, he just wants to know the answer). I am interested in reader feedback as to whether this is what you want to know and if this and subsequent blogs help. The good news is that, contrary to the college myth, organic chemistry is easy. It is freshman chemistry that is hard (because it depends more on physical chemistry, that is, physics), so I think I can get you up to speed on biochemistry and nutrition pretty fast. I am duplicating some of the material on my YouTube presentation but people told me that that is not always the best format. So, organic chemistry is easy. That’s the first thing. The second thing is that chemistry is structural, that is, visual and what a chemist sees in chemical formulas is visual objects. I am going to show what a chemist is thinking about in dealing with chemical formulas. It’s graphic, so I will try to use as few words as possible. Comments on the figures at the end of the post. What a chemist sees in the formula H2O is a diagram, or structural formula. What a chemist thinks of when they see that diagram is the ball and stick model or maybe the so-called space-filling model which is supposed to be closer to what you would see if it weren’t that molecules of water are too small to be seen. Carbon Forms bonds with Other Carbons and Carbon Atoms Can Form Chains – Think of two methane molecules tied together by replacing one of the carbon-hydrogen bonds in each with a carbon-carbon chemical bond. The two carbon compound (C2H6) is called ethane. We can, similarly build up chains of carbon atoms. which will be the skeletons on which millions of organic compounds will be constructed. Carbon always forms four chemical bonds. A compound that has only carbon and hydrogen is called a hydrocarbon. The series built up from ethane are called saturated hydrocarbons (other name: alkanes) meaning that they have as many hydrogens as possible. STOP. Are you with me so far? If so, you should commit to memory the names of the ten hydrocarbons. Everything else depends on this. Most organic compounds are given names based on this system. Organic compounds have two parts: a hydrocarbon backbone and a functional group, the non-hydrocarbon part that contains the chemically reactive part of the molecule, the functional groups. The assumption is that all compounds with the same functional group have similar chemistry. The millions of organic compounds are grouped into classes: alcohols, aldehydes, acids, sugars, amino acids, etc. based on which functional groups they contain. It’s easiest to understand by example. Look at the alcohols. Start with the simplest functional group. The combination of oxygen and hydrogen as a functional group is called hydroxyl. Any compound that has an hydroxyl group is called an alcohol. The common term “alcohol” refers to ethanol, one specific type of chemical alcohol. The simplest series of alcohols are those derived from the saturated hydrocarbons. If the hydroxyl group is added at the end of the chain, the compound is called a primary alcohol. To name such compounds, you count the number of carbons, use the name from the hydrocarbon, e.g., ethane and remove the “-e” at the end and add “-ol.” The figure below shows you that no matter how complicated the hydrocarbon backbone, if there is an OH group, the compound is an alcohol. 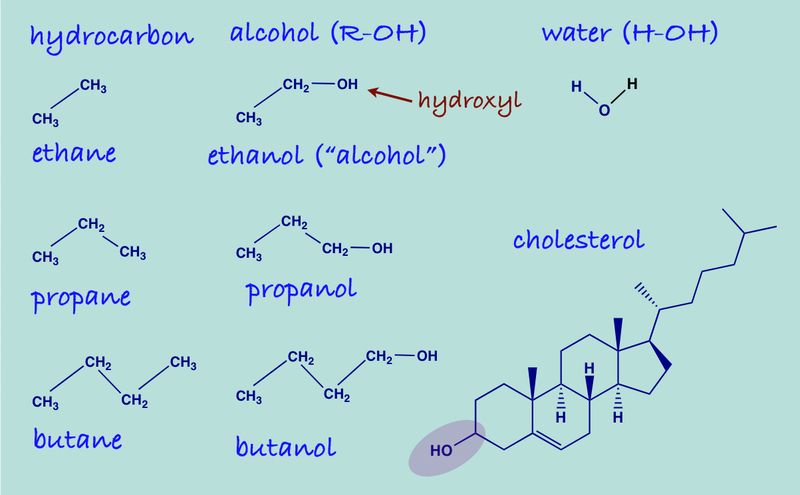 Cholesterol is an alcohol (you can figure out that if you know that a structure has only CH groups, they can be indicated just with the geometry without writing the symbols, each vertex in the figure representing one carbon atom). Aldehydes, sugars and sugar alcohols. Do I get it? Answers in the comments. Can you write the structural formula for octanol? When there is more than one hydroxyl group, the number of groups may be indicated by “di-, tri-” etc. The common compound glycerol would be called propane triol. What does it look like? Thanks for doing this! It’s been over half a century since my one semester of college chemistry, and YouTube doesn’t work very well on my dial-up connection. So I’m very glad to have the information here in living black and white. I’m looking forward to your upcoming posts. Hmmm. 3 carbon molecules, all with an OH molecule? Oh…Question 1 didn’t get answered. I’ve been reading your blog for some time now and it’s been very enjoyable and educational. This post if fantastic, just what us uneducated masses need to understand all the good work you and all the other health bloggers are doing. I can’t thank you enough and greatly look forward to the rest of the series. To answer the last sentence from the first paragraph, YES, YES, YES! My profession is a personal trainer and nutritional consultant, and I spend every morning scouring through blogs like this one and reading research papers. It’s my obligation to know my stuff. Looking forward to a continuation in similar vein, as well as the follow ups on your YouTube tutorials. One wish, though: I don’t quite understand the graphic on cholesterol and how would that look when presented as the chemical symbols like all the other molecules in that last picture. Could you post one example with the same molecule presented in both ways? I think it would really make it easier to learn how to read those hexes. Thank you! 1. Draw the molecular formula for hexane. 2. Connect the ends of the molecule by making a carbon-carbon bond. 3. Recognize that now you have a hexagon-shaped objects all of whose vertices are CH-2. This molecule, not-surprisingly, is called cyclohexane. 4. Since you know that all the points are CH-2, you can save time by just drawing the geometric figure. 4b. To make sure you have the idea, draw cyclopentane. 5. Now draw a structure with two fused rings: two hexagons sharing a common side. This structure is called decalin (because it has ten carbons). 6. Draw a C at each vertex or intersection. Now fill in hydrogens so that every carbon has four bonds. There should be 8 CH-2 and 2 CH. 7. You can make a complex structure with three fused hexagons and one pentagon, as in the drawing. This structure is called cholestane and is the basis of the cholesterol in the drawing. 8. If all this makes sense, Google “cholesterol structure” and click on “Image” in the top menu bar and you’ll see different representations. Thank you Dr. Feinman! What a great idea this is to give a primer on biochem and an organic chemistry lead-in (and your blog is terrific, too). At university, I took an Organic Chemistry class on my way to a Biology degree and I loved it. It was a long time ago now, but frankly, I did so well in organic chem that I should have pursued that field instead. Up till now I hadn’t realised that part of my success with organic was that it is very much a visual subject, as you pointed out. That was cool. Anyway, it doesn’t matter too much now because I didn’t end up as a biologist. I am an artist/art teacher with a keen interest in nutrition (low-carb & paleo) and in physical culture. After reading 30-odd books on these subjects (and counting) I decided to brush up on my biochemisty and physiology and purchased a couple of university texts (for biochem I have Horton, et al., “Principles of Biochemistry” 4th ed.). Anyway, your current posts are most welcome and timely and, in general, your blog has become one of my primary “go-to” sites! Thanks. Thanks for your comments. In the way of questions, look at my reply to Sami Paju below. Future posts will have more questions. Thanks, I enjoyed reading this. Chris Masterjohn has a similar series of pages. I think that his inclusion of details about bonds, electrons, etc. made it easier to see the larger picture — are you planning to cover that as well here? In any case, I look forward to the upcoming posts. I will do that. Nature of the chemical bond, electrons, etc. explains what happens in chemistry. The goal is to show that chemistry get the connection between chemistry and nutrition as fast as possible. What we are doing would be very difficult except for the other sources out there. When something isn’t clear, you can google it. Thank you for you posts, Dr. Feinman! It’s funny how when I took O-Chem in undergrad I just skated by only to learn several years later how important it would be. Now that I’m planning on pursuing a Ph.D. in nutrition information like this is paramount to understanding the underlying mechanisms. Please keep the posts coming! I think undergraduate organic is not taught in the best possible format. On-line teaching and increased use of audience feedback methods may make this better. The problem is that in a large university there is too wide a spread in student interests and while it is a great course for many people (I was one of them), for some relevance to biology could be brought out earlier. Oozing with common sense. I had both organic and biochem at U.Mass in the 80s and the classes and professors were good, but your teaching style brings order to chaos. I look forward to more posts.